Welcome to my detailed buying guide about grass trimmers. This is written especially for people living in the United Kingdom. 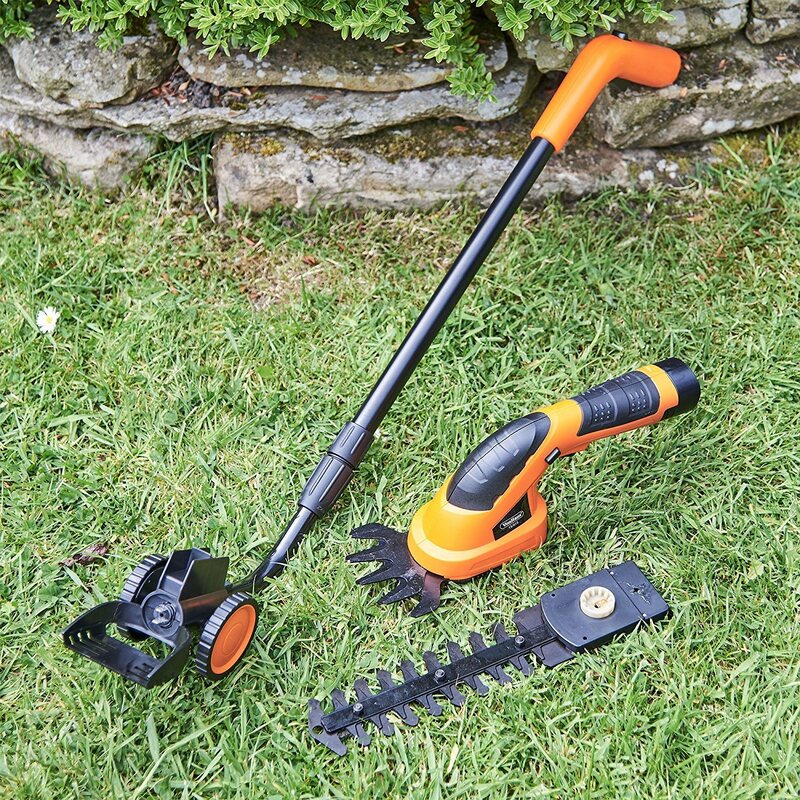 There are different types of grass trimmers available, corded, cordless and petrol. I will get into those later in the guide, but let's begin by explaining the features that are common in all types. There is no doubt that these are a very useful gardening tool to own. They are however one of the most frustrating ones to use. if you have ever used one, you might already understand what I mean. Breaking lines, jammed spools and not being able to find spares can make many a normal gardener go insane. Below I look at all of the features for grass trimmers, often referred to as grass strimmers in the UK. In some other countries these are also known as weed eaters. All grass trimmers work in a very similar manner. The only thing that is different is in the way that they are powered up. Some are manual. some corded, come cordless and some run on petrol. So just for the moment forget about the power method, as I cover that in detail later in this article. Grass trimmers work by spinning a piece of nylon cord very quickly through the grass. This nylon cord is often referred to as the "line," or the "string." This line is typically held in a spool at the bottom of the trimmer. A motor will drive the head in a circular motion, and the line then whizzes around, cutting through grass, weeds and most things that gets in its way. The actual mechanics of this are very simple. You can buy different thicknesses of this plastic line depending on what you are trying to cut. For normal grass a thin line works perfectly well. For tougher jobs like weeds, you are better off with a thicker line. Avoid any type of cheaper string or line. They are useless, will constantly break and over time drive you slightly insane. String comes in many different sizes from thin to thick. Your trimmer brand and model will determine which sizes you can use. For tall grass or weeds, a heavy gauge is always best. Some trimmers have twin lines, or often referred to as dual lines. They can cut faster and handle tougher grasses. These normally attach to the strimmer as a spool, where the line has been wound around. When the spool is finished you can buy a replacement. It is almost always cheaper to buy the line, and wrap this around the spool yourself. 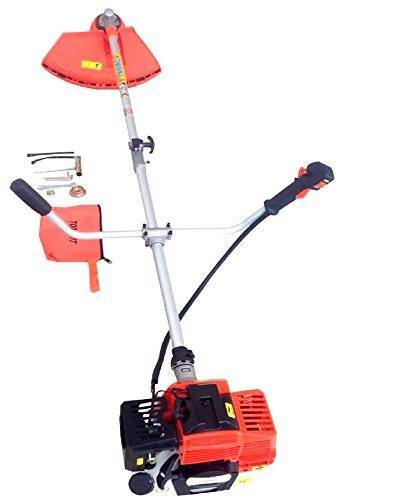 That is also a good idea, if you are having trouble finding spare parts online for your particular make and model of grass trimmer. My advice is to try and stick with popular brands if you are thinking abut buying one of these strimmers. Make sure that they have a UK based customer service, and that you can get replacement spools, or other parts for the model you are buying. You can also find replacement parts in places like B&Q, and some garden centres. Sadly that can be a bit of a hit and miss affair. You can also find these online as long as you know the "exact" model number. Different brands use different methods of feeding the line out through the bottom of your strimmer. There is no question in my mind, that this is the biggest cause for concern, and generates the most complaints. When the line constantly breaks, and you have to keep on fixing it, that can certainly drive you nuts. Allow me to explain the two main types of feed, and which I strongly recommend. ​You can feed the line out by bumping the base of the trimmer on to the ground. That in turn "should" push the line out to a longer length. So with 2-3 bumps, the line should be long enough to use once again. That is the theory anyway, but in my experience, this is a real hit an miss. More times than enough you end up taking the spool off, winding some line out, and then put the spool back on. That dear readers is a huge pain in the rear, and also a dirty old job. As the name would suggest, this is an automatic line system. Sensors pick up that the line has been cut or damaged, and automatically feeds more line through to the base. To have this feature, then you have to spend a little more to buy your trimmer. Please just do that as it will save you from wanting to fling the strimmer into the nearest lake. I can not stress how important this is when you are using a strimmer. Most people just want to get the job done, and a line that constantly breaks will drive you crazy. Spend a few extra quid and get an auto-feed and avoid the stress. Apologies for all the talk about the different type of line and line feed, but for me that is the most important feature to consider. The weight and the balance of your strimmer is without doubt, the next most important feature to consider. You will be holding this just above the ground. Depending on the size of your garden, and the task you are doing, that can take a bit of time. Holding something the size of a trimmer, can get tiring on the arms, shoulders and your back. Now if you are a young, fit and healthy 20 year old, that is probably not a big issue for you.​ However if you are a 58 year old male like me, it really is. All trimmers have certain parts like the motor, the shaft, handle and the power supply. Petrol trimmers are heavy, because you are holding a small engine, as well as all the component parts. Normally these should come with a shoulder harness, that helps support the weight. Cordless can be heavy also, as you have the battery weight to consider. The corded is usually the lightest as the power is fed through an attached power cable. Having two handles really helps balance the weight, and allows you to easily move forwards, backwards and from side to side with ease and control. Most good trimmers have a handle at the top, and then a second handle lower down, which can be adjusted to suit your height.​ If you make a few tweaks with this, you can get a nice balance to your trimmer, and that gives you full control. ​These come in straight shaft, bent shaft and telescopic shaft. The straight shafts are better and stronger and designed for taller people. The bent shaft is a design feature that allows shorter people to use a grass trimmer more effectively. I prefer the telescopic shaft. That allows you to adjust the length of the trimmer to suit your own stature. Feature 4 - Grass Trimming, Edging or Both? People buy one of these to cut grass, weeds and to reach places that your lawn mower can't. Some simply buy these to do the edges of their lawns, or to cut around plant or flower beds. Many buyers want to make use of both trimming and creating neat edges. To do that you will need a trimmer that has an adjustable head. Normally you simply turn these through 90 degrees, and the change is simply made. Most brands and models have this feature. If it is very important to you, just check when buying that it can do both tasks. Many of the models also use an edging wheel. This is a really useful feature, ​that can help a lot to create a really clean and nice looking edge. These are the most popular and usually cheaper than other type of grass trimmer. Now we have already discussed many of the common features, but there are some unique ones for this type. Primarily that is the size of the motor, and the length of the cord. The bottom line here is that these need to be plugged in. You are therefore usually limited by the length of the cord. That said it is fairly easy to plug these into an extension lead, and greatly increase their reach. For health and safety reasons these should be plugged into an RCD, which will help protect you from electric shock. There is always a risk that you can accidentally cut through the electrical cord, or it can get snagged and cut. The RCD will instantly kill the power and keep you safe. The motor is what drives the power to the head. In crude terms the higher the wattage on the motor the more power you have at the bottom of the strimmer. There are no emissions from this corded type, but it does cost you money on your electricity bill. As you can imagine these use rechargeable batteries. The better the quality of the battery, then better your trimmer will be. Even the very best ones will give you enough power to strim for about 30 minutes. Most commonly that is about 15-20 minutes. A full recharge can take around one hour. That is not great if you just want to get the garden finished. For small to medium size gardens these probably work ok. For larger gardens I would not recommend it. These are also more expensive than a comparable corded trimmer. These typically last about 3-5 years before they eventually stop working. Buying a new battery is VERY expensive, and in almost all cases, it can even be cheaper to buy a new strimmer. As well as the features we have already discussed, petrol grass trimmers have other features that we need to have a closer look at. They use a 2-stroke engine and they are loud. Now personally I love the roar of the small engine, but if you are not used to it, they are noisy. That said they are powerful, and with a heavy line on them, can chomp their way through the toughest of grasses and weeds. A typical petrol engine, if properly maintained can last you 10-15 years. They do however cause emissions, and those of you who want to protect the environment, will probably want to give these a miss. If you fancy one, then try and buy one with a spring assisted starter. That makes the trimmer a great deal easier to start. Many of these models used to push the fumes out through a side exhaust. The better ones use a system that pushes the fumes out to the rear and away from you. I also like a plastic translucent style tank so as I can easily see when the fuel is getting low. Sadly many people will ignore this section, but I truly hope that you don't. Generally speaking this garden tool does not throw up any major risks in the garden. People use these every day without any mishaps. There have however been deaths caused by these and some serious accidents. A man was killed when a piece of metal flew off the trimmer and hit him. Other injuries caused included the line hitting the ankles and lacerating those. Some people buy second hand versions of these, and that is not something that I would recommend.​ You just never know what condition it is in, if it has been dropped, or has been damaged in any way. 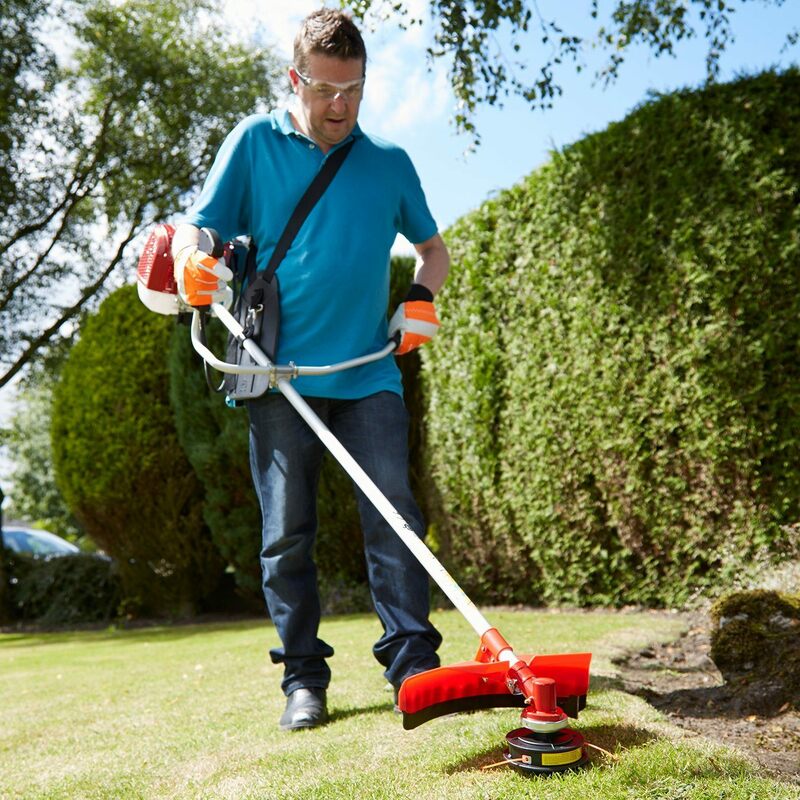 The UK accident help advice line offer some great advice on how to safely use a strimmer. Here is my own advice, and it is well worth the short read. Protect Your Eyes - ​A set of safety goggles makes sure your eyes stay safe. One common thing with all strimmers is that they go very fast, and can easily, and at GREAT speed toss a stone upwards. If it hits your eye, then you are in big trouble. Council workers tend to wear the full face mask for this very reason. Personally I wear simple lightweight safety glasses that only cost £2-3. 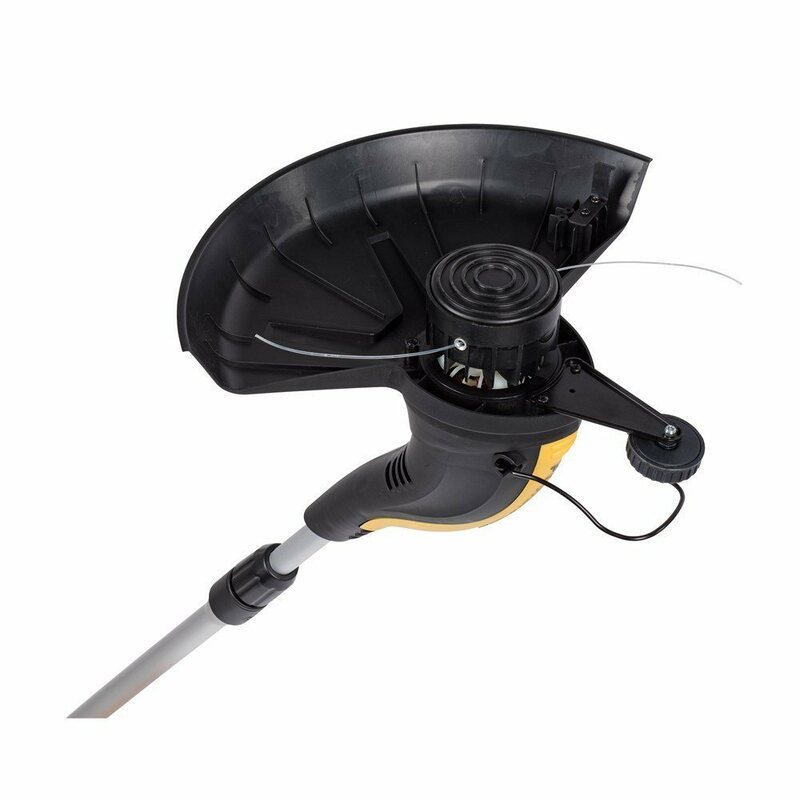 Protect Your Ears - ​I love petrol strimmers because they are powerful and portable. They are really noisy and a set of ear protectors will prevent any damage to your ears. Cordless are corded trimmers are not so noisy. That said, they are still noisy enough. I would recommend using some form of ear protection and even a simple ear bud will do. Your Valuable Toes - ​I have seen a lot of people using a trimmer wearing a pair of sandals. That is a really bad mistake. I would recommend some type of protected shoe, or at the very least closed toe shoes. Why risk your feet to the whip of a spinning line, that will make one hell of a mess. Safety shoes with steel toed caps are the best. If you don't own these, then my advice is to wear a closed shoe. Gardening Gloves - ​These can help with an improved grip. They also help keep your hands clean, and also allow you to grab and clear away hedges, thorns etc without jabbing your fingers. These are inexpensive and any gardener worth his salt, will own several pairs of these. RCD for Corded Garden Products - ​All electrical appliances can become dangerous if the wiring becomes loose. This is also the case if their power cords become damaged or if they get wet. Not only power tools like lawnmowers, trimmers, etc can cause electrocution-it is also possible if fingers, wet hair or other conductive bodies enter the appliance. A simple RCD appliance offers a high degree of safety. 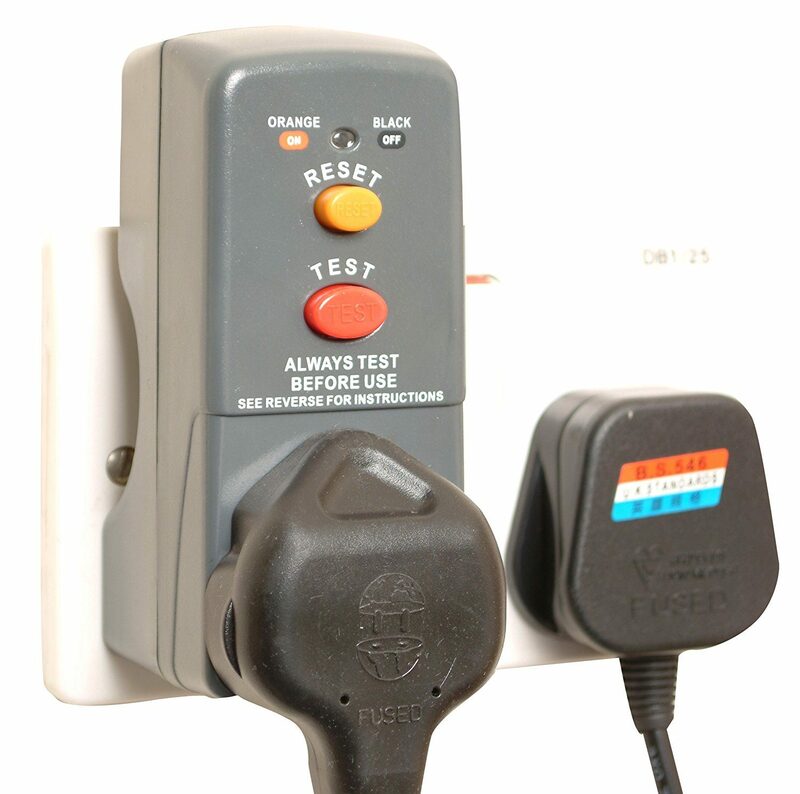 This is just a simple protective device that costs under £10.​ The safety RCD adaptor plug simply plugs into the mains. You then plug your electrical appliance into it. If there is a fault in the tool you are using, the unit cuts the power very quickly, reducing the risk of electrocution. 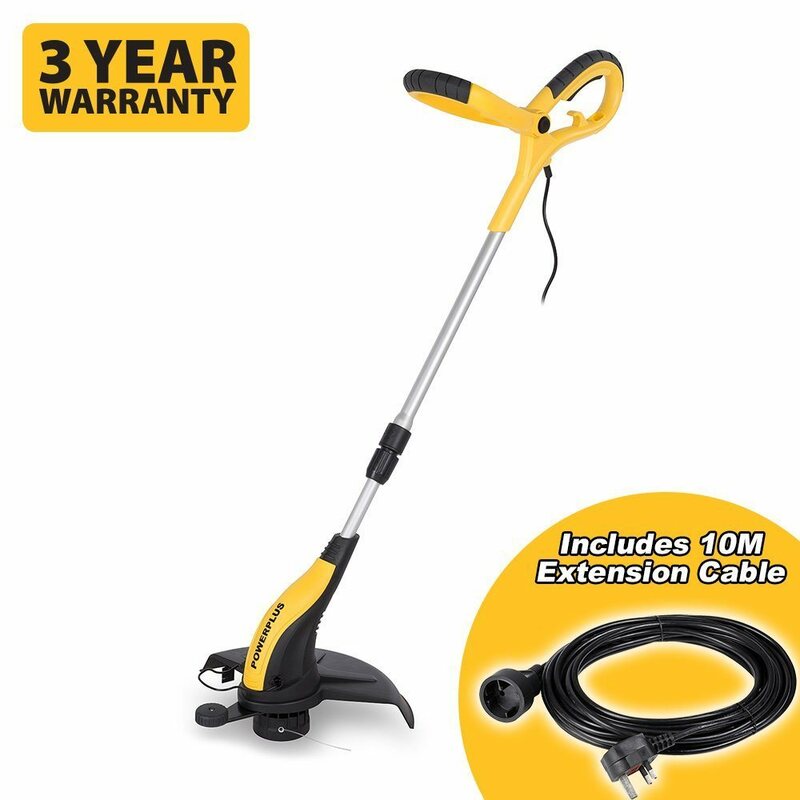 This can be used for any electrical garden tool, and offers great peace of mind. You will only need to consider this, if you have decided to buy an ﻿﻿electrical corded trimmer. Petrol Engines - Hopefully the risk with petrol engines are pretty obvious. They use a mixture of petrol and 2-stroke oil. That is a dangerous mix, so don't be having a cigarette when using one of these. Also watch out as the engine gets hot after use, and it is all too easy to touch this by mistake. These are also heavy, and over time can place strain on the shoulders and arms. Just watch out for tiredness as that often leads to careless mistakes.